Geddex’s Car Lot Marker is specifically designed to be safe on all glass and acrylic surfaces, including Lexan®. It goes on like shoe polish, but wipes off like chalk. Our special formula can be used on all cars and trucks, and even motorcycles and boats. Clean up is a cinch too. 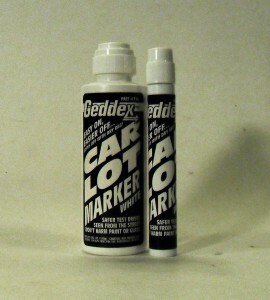 Our Car Lot Marker can easily be cleaned off any surface with water or a dry rag.